What Do Renewal by Andersen Warranties Cover? We st and behind our product and our work. We provide coverage on glass and Fibrex® components as well as on other parts for 20 and 10 years, respectively. These warranties protecting your replacement windows against material and manufacturing defects, ensuring no failures for the years to come. Furthermore, we provide a two-year warranty for our installation, safeguarding your investment against workmanship errors. Under normal circumstances, we’d fix any failure due to installation-related issues. How Are Renewal by Andersen Warranties Different from Others? Our windows company acts as both the manufacturer and installer. Unlike other window replacement providers, we’re the only source of all the guarantees we offer, highlighting our one-company accountability. It’s not uncommon for homeowners to be left liable when window problems occur. When more than one organization is involved in your home project, the manufacturer and installer might blame each other in hopes of avoiding responsibility. That would never happen if you choose Renewal by Andersen of St. Louis. We h andle every aspect of the project, subcontracting nothing to a third party. Although the odds of experiencing problems with our custom products is minuscule, expect us to take full accountability of any shortcoming we may make. Just like with our doors, the stellar, limited warranties on our windows are fully transferable. They wouldn’t end when you move; rather, you could pass them down to the next owner of your home as long as they’re still valid. You may have no plans of selling your property in the future, but investing in windows with transferable warranties could help increase your home’s value. As the authority in window replacement in Missouri, turn to us for the most powerful warranties in Chesterfield, MO. 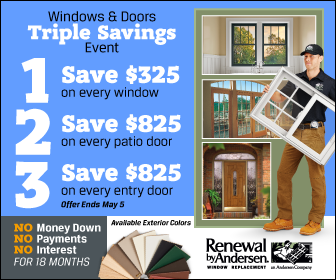 To learn more about Renewal by Andersen of St. Louis’s window and door guarantees, call us now at (314) 332-2364. We’ll be happy to schedule your FREE, in-home consultation at your most convenient date and time.